Accessibility is all about making computers easier to use. I enjoy showing people how to work with computers in different ways, and indeed having things like tablets and smart phones can be a complete surprise for many people who found the whole files, folders, desktop and windows experience a little too much to take in. I hope to post another time about smart phones and the whole ‘touchy-feely’ computer experience. This post is about getting the most out of the Office in a Box with the help of a great website that everyone should know about. Whatever type of computer you use, there is accessibility help which can help you communicate, learn and entertain yourself with a computer. I’m going to introduce some system settings which will be of use if you are learning to use a computer, and can even improve how you work with your office in a box; I’ll provide a few links into specific parts of the My Web, My Way site. This function doesn’t always mean too much to most people, but if you have problems with your hands and you want to make the computer easier to use, it is very, ahem, handy. Also useful for people with a broken arm who can’t use both hands, or have limited movement. Even if you don’t need to be using the modifier keys (Ctrl,Shift, Alt and Windows key) making capital letters becomes straightforward. For example, making a document print quickly would be pressing the Ctrl key and p together. Sticky keys would enable you to press the Ctrl key first, then the letter p. This is one of those situations when you have to do it to see what it does, as instructions don’t really describe this very well…or is it my level of writing? Anyway, anyone can practice this, be my guest. As I mentioned at the beginning of the post, not everyone gets to work in an office, and not everyone learns to type. I have taught many people in this scenario, and many tend to think the keyboard is just like the typewriter of old, needing some muscle application to get the letters imprinted onto the screen… There are also many people just learning to type, and may need to change the keyboard sensitivity so letters aren’t flying across the screen, causing more spelling mistakes than usual. This feature was made to enable people of differing levels of muscle control to use the keyboard. Windows has the ‘Filter Keys’ feature which also stops accidentally duplicated keystrokes, Apple OSX has the ‘Slow Keys’ feature which does the same thing. both systems have very similar attitudes to assisting keyboard use, although I can’t seem to find the switch to make the text cursor wider, or to change the speed of its flashing in a text area. 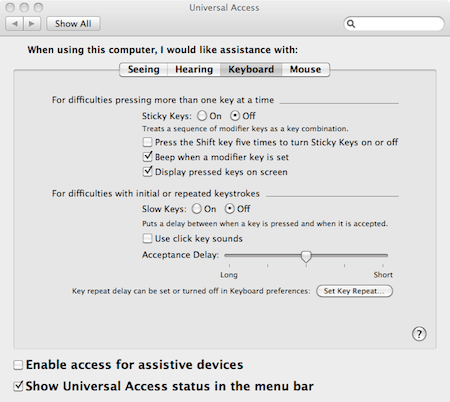 More keyboard accessibility here and here. A mouse doesn’t have to be the only way to move the pointer around the screen. I have a friend that had ongoing troubles with his wrist, and the mouse made it worse. I recommended he tried using a graphics tablet instead – I lent him my trusty tablet to try out, and in days had bought his own. As it is, he’s a keen digital photographer, and the tablet has increased the enjoyment of his hobby. A tablet is not for everybody though, and there are many ways of moving the pointer around the screen. A trackball is a neat way to move the mouse too, but these are only a couple of options…have a look here to see a more complete list. I am. This is not about politics, but about which hand you favour – for writing mostly. I often say that left handed people are in their right minds, and indeed they are, as we all use one side of our brain to work the opposing hand; so the right side of my brain is controlling my left hand. So besides my smug comments, this issue affect many computer users as this is the most simple option to change around on a mouse and can improve your experience immensely. This runs into the next option for making life easier, changing the double click speed. Just to clear something up, double clicking indicates 2 actions to the computer – select something and open it. Web pages have links with one click buttons because they are not on your computer which confuse things, but actually double clicking can be awkward if the speed is too fast. Hmm, not too friendly the language here for OSX :The tracking speed is the actual speed of the mouse across the screen, the Primary Mouse button is the one you do clicking with. Some essential mouse settings are sitting in the Mouse option in the system preferences. Apple have decided to split the settings up for fine tuning how you use the mouse. Not very much to see here, but changing the mouse from right to left handed could change how well you get things done. Look at the Universal Access window for more options. On Windows machines: Depending on the version of Windows, you need to get to the control panel and then to the mouse icon which needs to be double clicked to open (unfortunately). When that’s opened you will see a new window with a bunch of tabs.the language here is not too friendly, but if you’re left handed you need to tick the box and see the buttons switch over. Seeing what’s on the screen. This is a many layered situation, as even people with 20/20 vision need some help now and again, especially with high resolution settings making everything smaller. Firstly things need to be bigger (or just usable) on the screen, then the level of contrast and the colour scheme can be adjusted to suit your individual needs. The size of windows in general can be controlled by the screen resolution – the more pixels, the smaller (and sharper) the items on the screen are. This is not an ideal situation, and fuzzy edges don’t make text easier to read. Windows 7 and Mac OSX both have built in magnifiers to make the screen bigger, but you may just need to make text easier to read, and just being able to read pages on the internet. Even though the Mac has had the magnifying software for longer (they call it zooming) it seems that Microsoft learned some lessons after their very poor offering on Windows XP. The options for OSX are not as comprehensive as the Windows accessibility options, especially as Windows has offered high contrast window themes for many years, going back to Windows 95. These features can be of use to a lot people, including those of us who wear glasses – there are many of us in that group. These settings can also make various colour combination to get the best possible reading screen for anyone, not just those with visual impairment. Dyslexic sufferers could also benefit from having a differently coloured set up. More details on setting up your display.